Jonny Venters was born on Wednesday, March 20, 1985, in Pikeville, Kentucky. 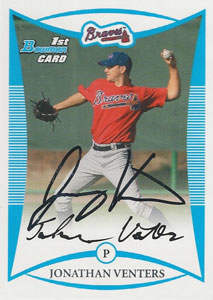 Venters was 25 years old when he broke into the big leagues on April 17, 2010, with the Atlanta Braves. His biographical data, year-by-year hitting stats, fielding stats, pitching stats (where applicable), career totals, uniform numbers, salary data and miscellaneous items-of-interest are presented by Baseball Almanac on this comprehensive Jonny Venters baseball stats page. Jonny or JV or J.V. Jonny Venters had Tommy John surgery on January 1, 2005. Jonny Venters had Tommy John surgery on May 16, 2013. Jonny Venters had Tommy John surgery on September 17, 2014. So, when he returned to the mound on April 25, 2018, he became the first pitcher to come back from three Tommy John procedures to pitch in the Majors ! Jonny Venters | Venters on Return to Mound | April 25, 2018 | MLB Advanced Media, L.P.